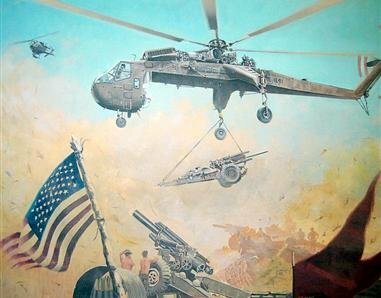 The Sikorsky CH-54 Tarhe, better known as the Skycrane, was the heavy lift helicopter employed by the U.S. Army during the Vietnam War. It was used extensively to emplace artillery, as shown here sling loading a 155mm Howitzer. It also recovered downed aircraft, and carried all manner of heavy objects from bulldozers to bridge sections.